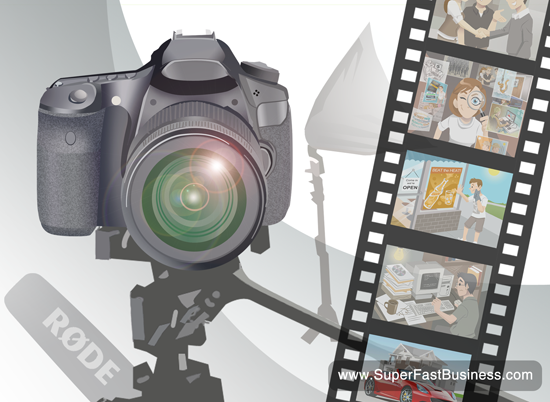 Want to create professional-quality videos for your business? Take some tips from video production expert Ryan Spanger. James: As you know, one of my best marketing activities is to create videos and put them out there on my website and in order to do that I’ve been through a steep learning curve. Especially with what equipment to use. I have tubs, like plastic tubs, full of discarded electrical equipment. I have microphones, cameras, cords, plugs, batteries. I think I have every possible combination. And I only wish I had attended a session like the one we’re about to have now where we get to find out from the guy who does it for a living, my friend Ryan Spanger here, who has a video production company. He does really good quality video productions and he knows exactly what gear you need to use. He also understands what it’s like as a smaller business and as a marketer that we’re not going to go out and buy the hundred thousand dollar gear, but we can, with a little bit of equipment, get a real edge on people who just want to do the cheap stuff. So I’m going to hand over to Ryan who’s a SilverCircle member and has been instrumental in helping me get my equipment set up properly and I’m still a work in progress and we’ve done some great reviews about it. But I’d love Ryan just to share directly with us, what are we going to be needing to make good quality videos. Let’s put it together for Ryan Spanger from DreamEngine.com.au. Ryan: Well thank you, James, and just so I can get an idea of where you guys are at the moment, can you raise your hand if you’re using video at the moment to promote your business? OK, awesome. A lot of people. Now can you tell me how many people are you… would you like to be using video more than you’re currently using? Yeah. And what about not using video at all but want to start? OK, cool. So this is pretty relevant and you guys are doing better than I was for a long time because I spent years making videos for other companies to help them grow their business but I wasn’t actually applying the same techniques to my own business. I was sort of like the story of the gardening service where my lawn was growing and I wasn’t actually, you know, applying the stuff to myself. And what I discovered is once I actually started doing this in my own business, things really took off, so I want to tell you some of the things I’ve been doing in my business to use video to make more sales. I want to tell you guys about personal sales videos because this is something that James taught me about. And this technique has actually tripled my closing rate in the last year that I’ve been doing this so I’m so excited to tell you about how I’ve been doing this. I’ll describe that system to you. Next, I want to take you through an ideal video production kit. So we’re going to go shopping and put together a kit for less than two grand that you can do fully professional videos. Then I’m going to take you through some tips to improve the quality of your videos and I think these are really easy wins, these are quite… actually quite basic things that you can do but a lot of people aren’t doing. And if you just apply these ideas, it’s going to dramatically improve your videos. And the idea is, by asking these questions, the notes that you’re going to get are going to reveal the script for your sales video. And what I make sure that I do is capture the actual language and terminology that they use. And if they use jargon and industry-specific terms, because the whole idea with this is that when I make my video for them, I’m showing I actually get them and understand where they’re coming from. I understand what their fears are. And what I try to do is isolate what the one thing that’s standing in the way from us moving forward. So I was speaking to a prospect last week and they said something that really stuck with me. They said, “I’ve been burnt before. I just have a fixed budget and I need to know that by spending this money, I’m going to be able to get what I want. In the past, we’ve had a situation where once the job’s come to an end, there’s been more changes and more changes and things that weren’t anticipated and I just don’t have the budget so I like what you have to offer but I need that reassurance. I need some kind of guarantee.” So I thought OK, let me make a guarantee for you and this is not a blanket offer that I would make to everyone but in this particular situation. “Hi, Ryan here, Managing Director of Dream Engine Video Production. When I created Dream Engine over 12 years ago, my envision was to build a market leading company that delivers remarkable results to clients. Video production is a competitive industry. The best opportunity that I have of continuing to grow a thriving business is to deliver exceptional service to you. And that’s my 100% commitment to you. I’ll only be satisfied when the video we create for you truly meets your needs, connects with your audience and drives the right results. That’s why Dream Engine has a video production guarantee. We know you’ll be completely satisfied with the work that we produce for you. Our commitment to you and your project is fully guaranteed. So in this case that block has now been removed. So the video goes up on Wistia, and analytics will tell me when they’ve watched the video and that’s my trigger to follow up with them so you know, timing is great with Wistia. I’ve removed that block and we’re now able to move forward. I’ve used this technique a number of times. I’ve actually said to my editors, “Guys, please don’t tell your friends about this because at the moment, hardly anyone is doing it. And it’s giving me such an advantage. The other types of videos that are working really well for me are case study videos, so how we’ve solved a similar challenge; testimonial videos and news updates. So I’ve basically created like an armory to back up my sales call. So once I send through a package or a quote, then I’ve got a whole library of material which answers specific objections or takes them through situations that other people have been through so plenty of proof and I guess since I’ve started actually doing this stuff, it’s just completely sort of liberated my sales process. So that’s just one technique. And that’s all very well that these are cool ideas but if you want to do it, you want to make sure your videos look good because if they don’t, you’re sort of shooting yourself in the foot. So I put together an ideal video production kit and the challenge I set for myself is, “Can I put together a kit for less than $2,000?” Now I don’t know if that sounds like a lot of money or a small amount of money but I started doing this work nearly 15 years ago. And at the time, you would have had to spend 10, 20,30 times that amount and you still wouldn’t be able to create results as professional as this as what you can do with this setup so like it’s an amazing time. You guys can download all of these. You can take the presentation so don’t worry about having to write it all down. But let’s look at each item one by one. So, this is the Canon 60D. Probably a few of you have got this already. This is the camera that James uses and this is sort of the DSLR camera of choice and I recommend… there’s these other cameras that are similar. I recommend this one because a lot of people are using this already. So if you want to learn, there’s plenty of people around you who are using it. The reason why I recommend this is that it creates that blurred background, shallow depth of field sort of look which looks really filmic. It makes it look really professional and at the moment, people love that look. Now the lens that goes along with that, that a lot of people are choosing, is the Canon 50mm F1.8. And what that’ll do is even enhance that blurred background filmic sort of look. Now the thing with this DSLR setup is that there’s a little bit more of the learning curve than just using a video camera. So what you might find when you start doing something like this is that you’ll get it out of focus, or you’ll start in focus then it’ll go out of focus. So be prepared for that learning curve. Be prepared for some frustrations but if you can stick with it, you’ll see the results. And you guys would have noticed the results of James’ work over last year. He’s stuck with using this equipment and practiced and mastered it. So, you need an SD Card to record on. This is a 32GB card where you can record about an hour and a half worth of footage. It’s a class 10 card so there’s cheaper cards than this. So, don’t get one of the cheaper ones. This is made for HD videos, it says on the card. Yeah, that card will do you fine. You’re going to need a lighting kit. So there’s a LightPro 3-Head Softbox kit. There’s many variations with this sort of kit but the main thing is that a softbox kit creates a soft light, which is like a flattering light. You see people in forums talk about work lights or lamps. Well, they might be filming without lights so there’s just these downlights from the ceiling which often create these ugly shadows underneath your eyes. So a softbox is a… just a really flattering neutral sort of light and later on in the presentation I’ll show you guys how to set this up. This is a Tascam DR-100 which is the audio recording device that we use. We’ve been talking about the Zoom H4n which is basically the same thing. So with the DSLR cameras, it’s better to record the audio into something like this than it is to go straight into the camera. You can go into the camera but this is going to give you better results. So, as you can tell, there’s a little bit more of a learning curve with this type of equipment but by recording the audio separately and then linking it up in the edit, you’re going to get a more professional result. This is a lapel microphone. Can you raise your hand if you’re using a lapel microphone? OK, cool. So a lot of you are quite familiar with this. The great thing about this is… and are you guys filming your videos often just by yourself, you’re doing it just yourself? Yeah? So it’s just really convenient because you can clip it onto your jacket or onto your shirt and if you want to make it look more professional, run the cable underneath your shirt so you can’t actually see it when you’re filming. I like this microphone, this Sony ECM-44B. It’s sort of a semi-professional microphone but there’s plenty of others along the same line so you know, test something out and see which one you like best. This is just an extension cable for your microphone. And a tripod. If you’re just doing face-the-camera videos in a locked off shot, all you need is a basic, cheap tripod like this one. I think it’s about $120 or $150. The important thing about buying a cheap tripod is make sure that it rises right up to your eye level because a lot of these tripods will only go up to maybe your chest sort of level and then you’re going to get that low angle kind of shot. Like, double-chin, up-the-nostril kind of effect, which is not so flattering. So that’s why this one is good. So as I said, this is just for locked off shots. If you want to do something a little bit more complex, like tilting and panning the camera and moving it around, then you’re going to need what’s called a Fluid Head Tripod, like the cool tripod over there. And that’s a lot more expensive. But for news videos and face-the-camera videos, all you really need is something that’s going to hold your camera, like this one. Spare battery for obvious reasons. And there’s… there’s the kit again. So I’m not saying that you have to have this if you want to make videos. This is, to me, a good ideal kit if you want a video production strategy where maybe you’re going to be making a news video every week or you’re going to be filming some customer testimonial videos. You might be moving around and it becomes part of your ongoing strategy that’s making you money, I see that this is a really good investment. Can I just use an iPhone? If you just have an iPhone at the moment, that’s fine. Start with that. You know, don’t let the lack of technology be a limitation. When I created my kit, I just started with the camera, tripod and microphone and then slowly added things like lights one step at a time. But I think the point is that if you’re going to build this in as part of your ongoing strategy, it’s a pretty cheap investment for the return that it’s going to bring you. So I’m going to talk you guys through my best tips for improving your sound and picture and framing. I thought to myself, “How can I, in 15 minutes, come up with the best ideas that are going to have the biggest effect on the quality of your video?” And it’s often the simplest things.